Coat: Saks Potts. Leggings: Spanx (I also own and love these and these). Shoes: Converse. Sweater: Atlantic-Pacific X Halogen. Pouch: Flynn. Phone Case: BaubleBar (see all my monogram gift picks here). Coat: Kate Spade. Shoes: Atlantic-Pacific X Halogen. Top: Zara. Pants: RedValentino (old). Bag: Chanel (found one for sale here). Love ♥️these statement coat looks, especially these cute leopard prints. Joyeux Noel! That last outfit is stunning! These statement coats are amazing!! The first one is too fab! All these are gorgeous! 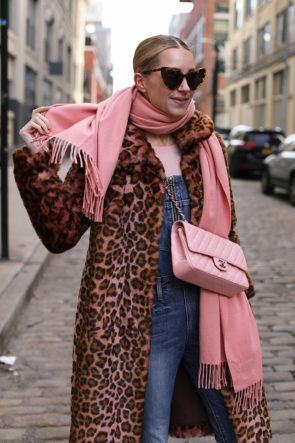 The overalls with the pink is my favorite look! These are all such fun options. My favorite is the orange coat. It’s such a beautiful statement piece and would be so fun to wear on a darker winter day. I loved your statement earrings by Fabia. They look very elegant and would pair well with a black festive dress. I love this content, its a very helpful, please share more.